As a true chocolate lover, I always have chocolate syrup at home because you never know when you will have a bowl of ice cream or a tower of fluffy pancakes. Homemade chocolate syrup is rich and fresh tasting and much more enjoyable than store bought versions. 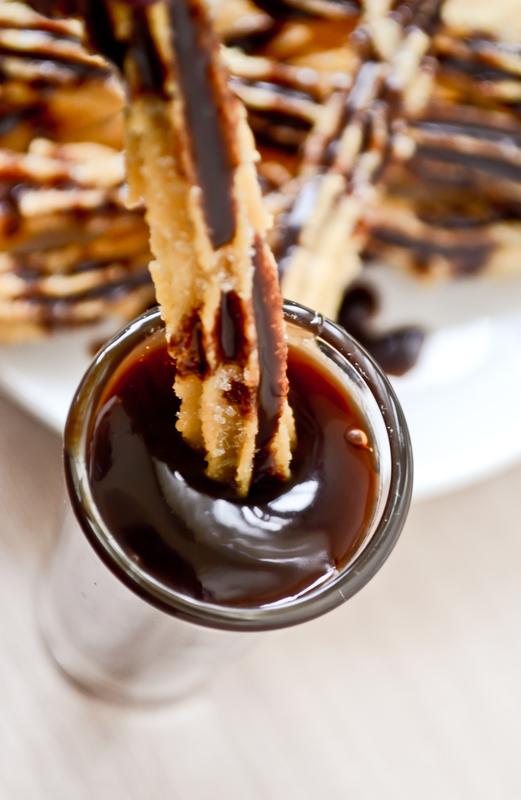 Hershey’s Chocolate Syrup is considered the most popular chocolate sauce worldwide. It was created in 1926 for bakers, soda fountains and restaurants so they could use it in their milkshakes, desserts, pancakes, and more. The popularity was incredible so two years later the company started to sell chocolate syrup in stores (remember the can it used to come in? That was my favorite). The easy syrup recipe is one of the best around in flavor and because of the texture and viscosity there are several options to drizzle: ice cream, pancakes, waffles, milkshakes, cakes, cupcakes, brownies, donuts, iced coffee, bananas, strawberries, crepes, and my favorite one, churros!! Most industrial chocolate syrup recipes call for corn syrup because it is shelf stable, thick and sweet. Our recipe is a simple syrup recipe where we avoid corn syrup. When it is this easy to make using our chocolate syrup recipe you should definitely keep the ingredients on hand. I recommend using high quality organic cocoa powder for the best result. Rainforest Bulk Cocoa Powder from Santa Barbara Chocolate is my recommendation because it has a cocoa fudge flavor and as chocolatier for the company I know it very well. I also appreciate the fact it is organic. ****You can also use this same chocolate sauce recipe using 100% cacao chocolate for a thicker more gourmet flavor. Please try our Pure Cacao Chocolate. In a large saucepan over medium heat, add the water, sifted Rainforest cocoa powder and sugar. Whisk them until the sugar is dissolved. Add the vanilla extract and pinch of salt. Keep mixing for 1 or 2 minutes more. Let the chocolate sauce boil for 1 minute and then remove it from the heat. When the sauce is hot you will see it is pretty thin, it will be thicker when cooled down. I recommend to store it in a glass jar, that is the way I like it; but you can also use something like a squeeze bottle. If you want to create a signature homemade chocolate sauce, change the vanilla extract to things like whisky, instant coffee, peppermint extract, orange extract, etc. In a saucepan over medium heat, add all the ingredients, except the all purpose flour, and mix until combined. Bring to boil and then remove from heat. Add the flour, previously sifted, and whisk until you get a dough. Fill a pastry bag with the dough and attach a large star tip. In a pan, heat oil to fry the churros. Pipe the dough into the pan, carefully, and fry them until golden. Sprinkle some sugar over the churros while still warm. If you like, instead of just sugar, sprinkle cinnamon!